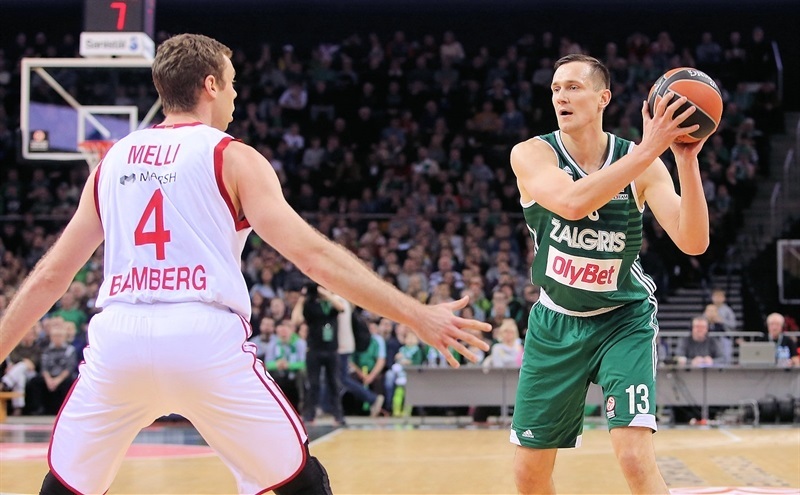 In a historic night for team captain Paulius Jankunas, Zalgiris Kaunas edged Brose Baskets Bamberg 75-73 at Zalgirio Arena. 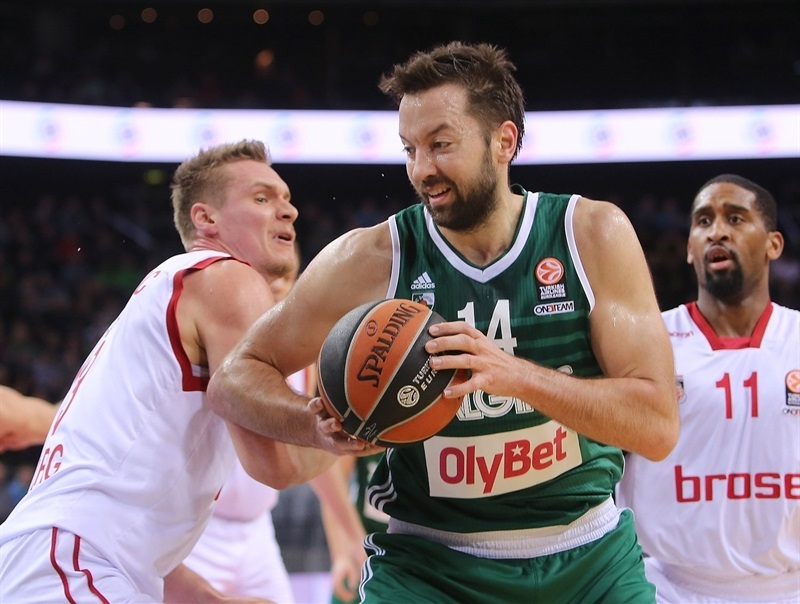 Jankunas scored his 2,000th career point in the second quarter and overtook Mirsad Turkcan for third place in rebound in Euroleague history in the fourth. Jankunas now has 2,007 points and 1,289 rebounds in his career. The victory snapped a four-game slide and boosted the Lithuanian champs’ record to 2-7, while damaging Bamberg’s playoff hopes as the German champs fell to 3-6 – and two wins out of fourth place. 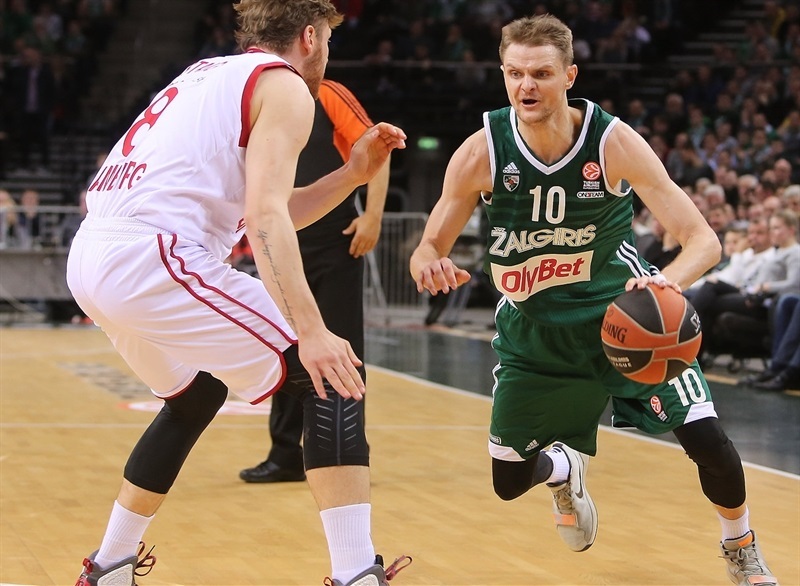 Jankunas starred early as Zalgiris took control with a 13-2 first-quarter run. The hosts looked to pull away, but Nikos Zisis shined in a career night to keep Bamberg close throughout. 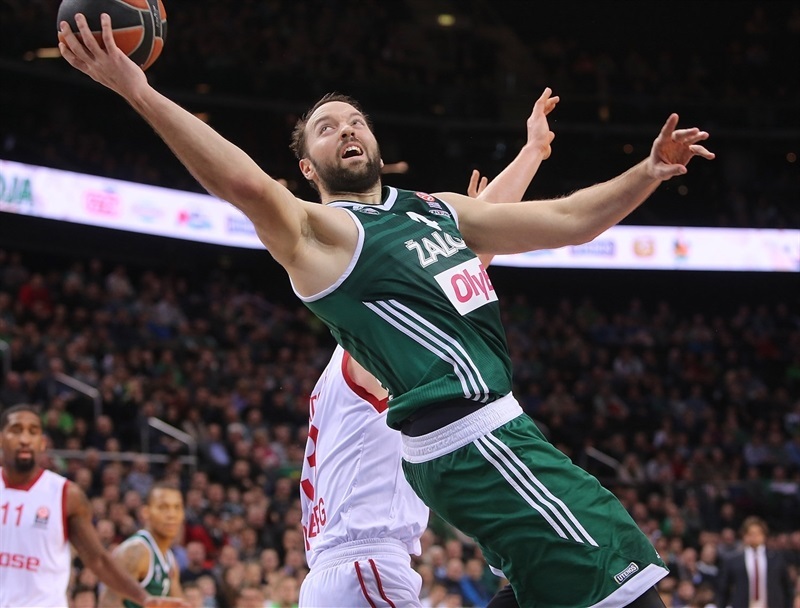 It came down to the final minute; Ian Vougioukas put Zalgiris ahead by 2 with 30 seconds to go and Bamberg missed twice in the closing seconds with a chance to tie. Jankunas finished with 17 points and 13 rebounds, while Vougioukas posted 13 points and 9 rebounds, Jerome Randle debuted with 12 points and 5 assists and Renaldas Seibutis scored 11. 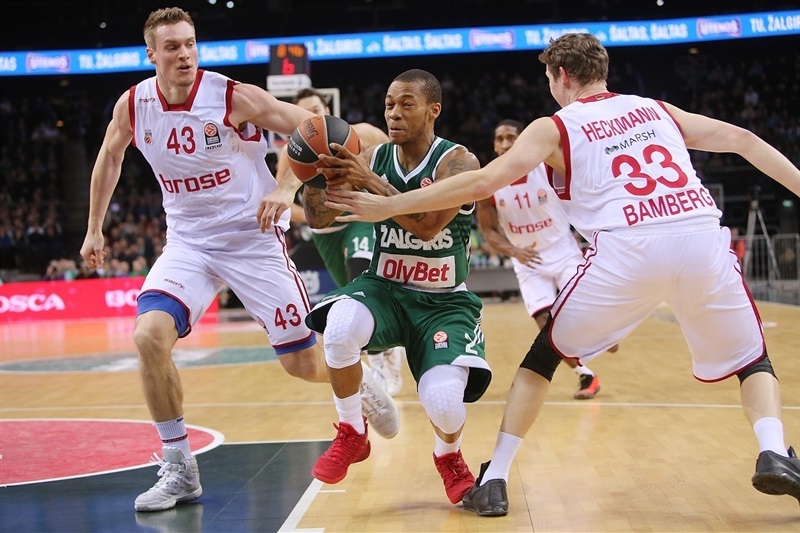 Zalgiris outrebounded Bamberg 43-26 – including 18 offensive rebounds, which made up for a disastrous three-point shooting night (1 of 14, 7.1%). 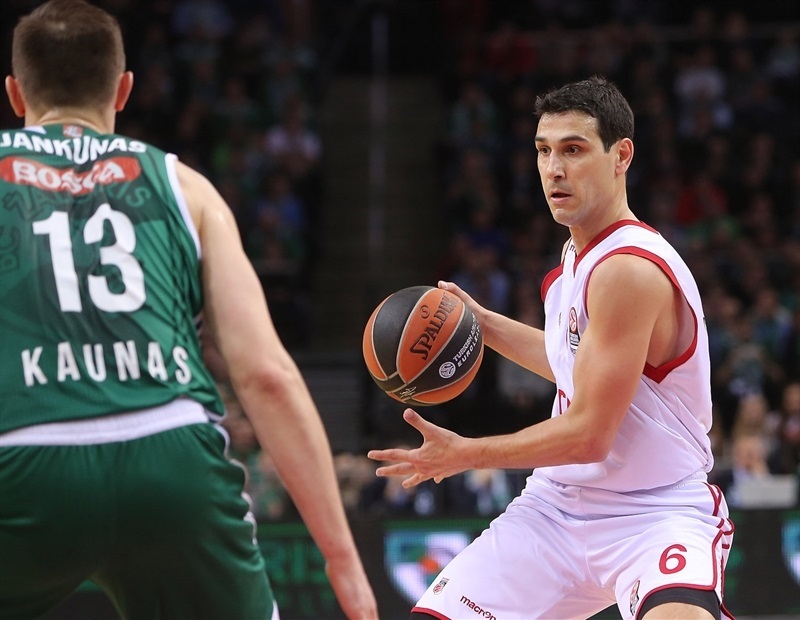 In his 248th career Euroleague game, Zisis recorded a personal best with 25 points to lead Bamberg. Bradley Wanamaker added 14 points and Daniel Theis 10 in defeat. Even though Zalgiris won the opening tip, Wanamaker got the visitors on the scoreboard first with a jumper. Zalgiris extended its second possession with 2 offensive rebounds before Jankunas drew a foul and scored his team’s first points. A Nicoli Melli slam and Jankunas layup kept things even after three minutes. Melli buried a jumper and Janis Strelnieks hit a three-pointer to put Bamberg ahead 4-9. Jankunas remained the focal point for Zalgiris; his pass set up Seibutis for a layup and foul and then the big man tied it with a three. Leon Radosevic sank a jumper and Randle set up Vougioukas inside to make it 11-11 midway through the quarter. Vougioukas battled for an offensive rebound, which he turned into free throws. Fresh off the bench, Brock Motum forced a steal that resulted in a fast break layup by Randle for his first Euroleague points. Bamberg called a timeout to try and stop an 11-2 Zalgiris run. Instead, Zisis missed a layup and Jankunas added 2 free throws. However Zisis found Theis for an alley-oop to end the Bamberg drought. But the momentum remained with the hosts as Kaspars Vecvagars added free throws and Seibutis sank a floater for a 21-13 advantage. Zisis led Elias Harris to the hoop for a layup, but a red-hot Seibutis answered with a jumper. Darius Miller connected twice from the line only to see Randle sink a jumper. Theis’s foul shots in the closing seconds of the quarter made it 25-19. Zisis made a mid-range jumper and Jankunas finished a tough layup in the first minute of the quarter. Miller took a seat with 3 fouls, but Strelnieks made a tough layup to keep the German champs close. 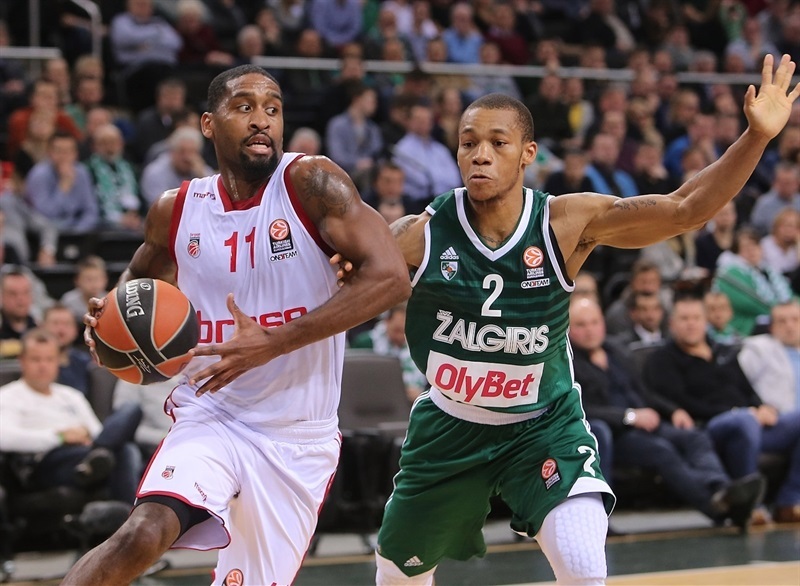 Olivier Hanlan put back his own miss for a 30-23 Zalgiris cushion. Wanamaker cut into the deficit with a three-pointer before Theis added a jumper. 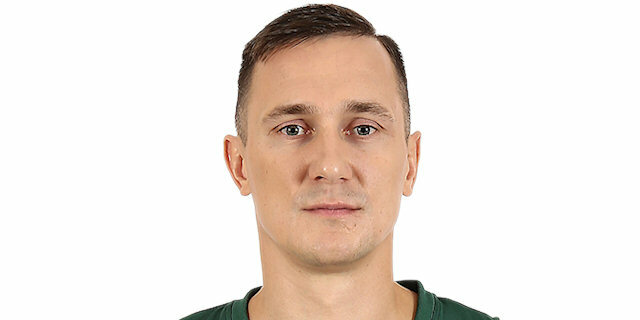 More than three minutes had passed from Zalgiris’s last basket when Jankunas rejected Radosevic to trigger a fastbreak that Vecvagars finished with a basket-plus-foul. However Wanamaker drove for a layup that made it 33-30. Seibutis’s free throws were matched by a Wanamaker layup. Vougioukas was next at the line for 2 free throws before Zisis hit a pull-up jumper. 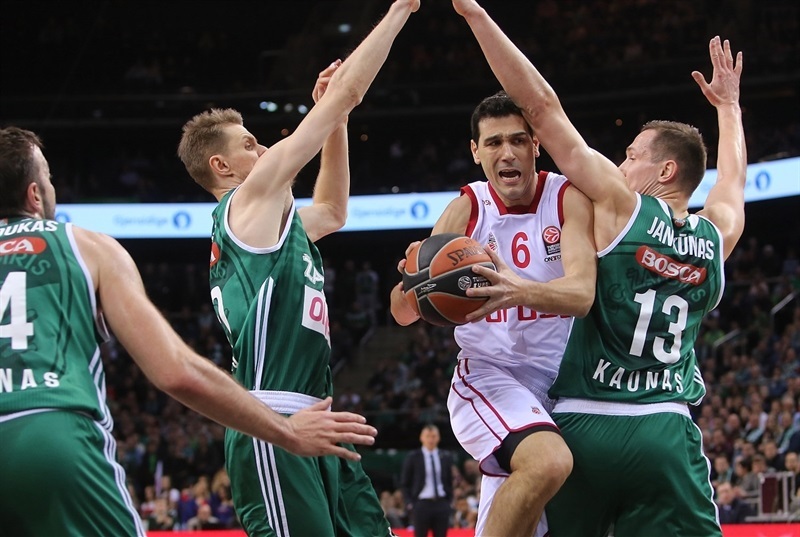 Edgaras Ulanovas kept Zalgiris in front with an offensive rebound and post-up score. Zisis drew Bamberg back within 3 with free throws. Siim-Sander Vene and Zisis traded jumpers to end the first half at 41-38. Jankunas sank a jumper to start the second half and Seibutis darted into the paint for a layup. Zisis got Bamberg going with a jumper. Ulanovas scored inside before Zisis got a shooter’s bounce on a triple to bring Bamberg within 4. Jankunas drilled a jumper, but another Zisis triple made it 49-47. Melli blocked Hanlan’s layup, but Motum followed for an easy score. Theis sank free throws, but Bamberg gave the points back up by allowing an uncontested layup to Hanlan. A three by Wanamaker closed the gap to 53-52. Melli split free throws to even the score. Randle restored the Zalgiris lead with a jumper, but Melli found Theis for a slam. Vougioukas free throws and a Randle jumper gave the hosts a 59-55 lead at the end of the quarter. Radosevic started the quarter with 2 free throws, then committed his fourth foul, stole a ball from Vougioukas and fouled out with an offensive foul. Baskets by Vene and Randle boosted the Zalgiris lead to 6. Vene grabbed Randle’s missed three and scored and Seibutis added a free throw to cap a 7-0 spurt for a 66-57 lead. Zisis revived Bamberg with a jumper and then a three-point play. Randle and Zisis traded jumpers. After a timeout, Melli nailed a three from the elbow to get within 68-67. Vougioukas made 3 free throws over two possessions and sent Theis to the bench with 5 fouls. Jankunas scored in the paint for a 6-point lead with three minutes remaining. Zisis sank 2 free throws and Patrick Heckman did the same. Wanamaker’s tough layup with 1:45 left evened the score at 73-73. Vougioukas put the hosts ahead with free throws with 30 seconds left. 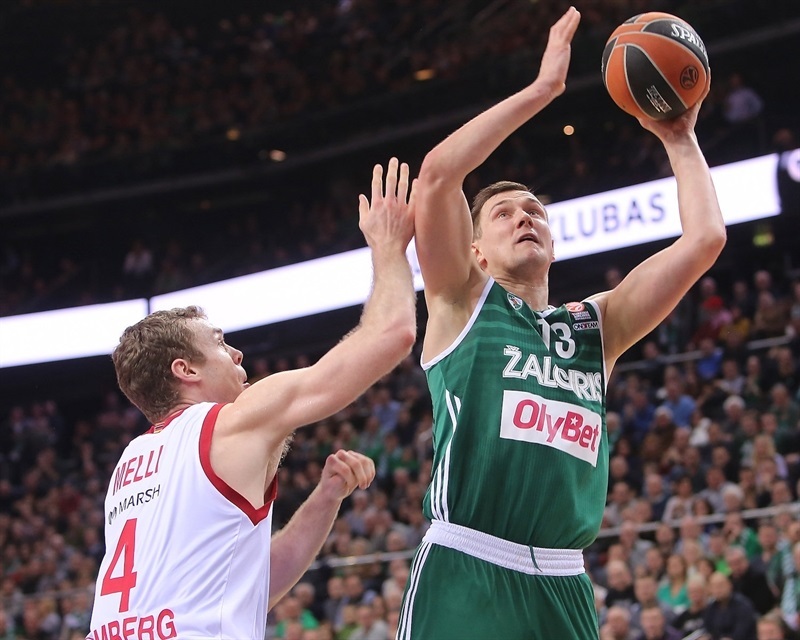 Zisis missed a layup in the closing seconds and Zalgiris collected the rebounds, but Ulanovas traveled with 2.3 seconds remaining to give Bamberg one last chance, but Strelnieks missed a layup at the buzzer. "We are very happy for the victory tonight. To win a game in this group is very hard. The game was exactly what we expected. We had a solid lead, but we lack experience and the final minutes of the game are always hard. A few times we were in control of the game, but we were not able to finish it calmly. The most important thing is the victory. Brose Baskets plays well as a team, so we wanted to let play just one player, not five, and that‘s why Nikos Zisis was hot and scored 25 points. Honestly I thought we were going to play overtime when Janis Strelnieks had a good opportunity to tie the game, but he missed and I‘m happy for the win tonight. " "It‘s a mistake to think about a missed shot when you lose a close game. An open shot is not a bad decision, but we were not good enough and not even decent enough on the glass. When you let your opponent to grab 18 offensive rebounds, you can‘t play. So I‘m surprised that we finished a game with a single possession difference. We had just 3 offensive rebounds and they outplayed us in rebounding. It was a tough game. We had foul trouble, but we found a way to come back, but made some bad turnovers in the last quarter. 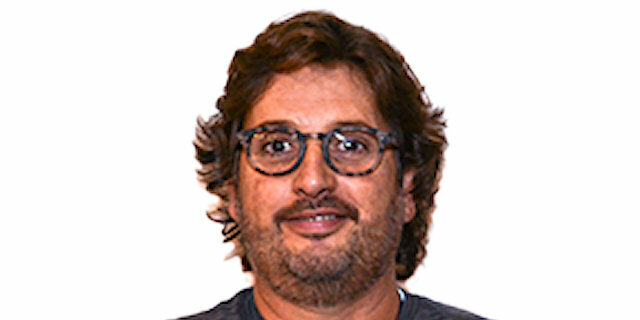 Nevertheless, I have no regrets for my players’ desire and will. My big regret is my team’s toughness on rebounding." "It was a close game and we never thought that we have the win in our pocket. 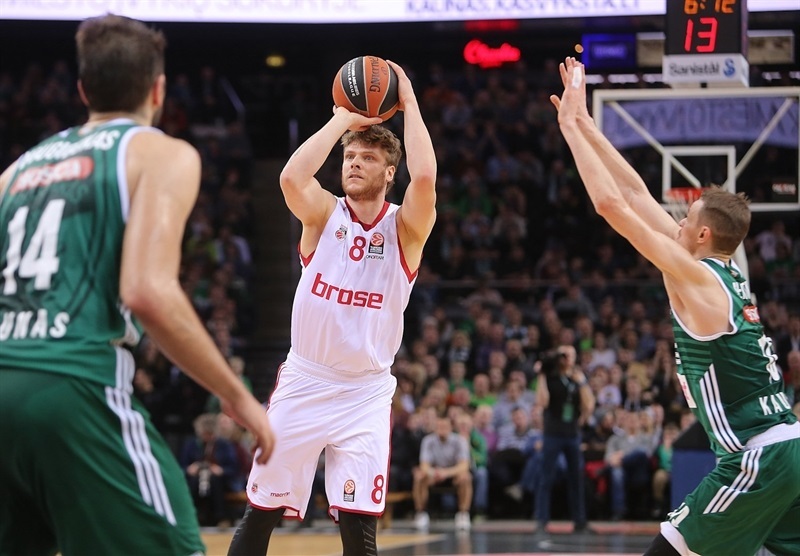 We had a 9-10 points lead, but we knew Brose Baskets always plays till the last second. We played in front of our fans and improved a lot from the last meeting against Brose Baskets, which allowed us to win tonight. " 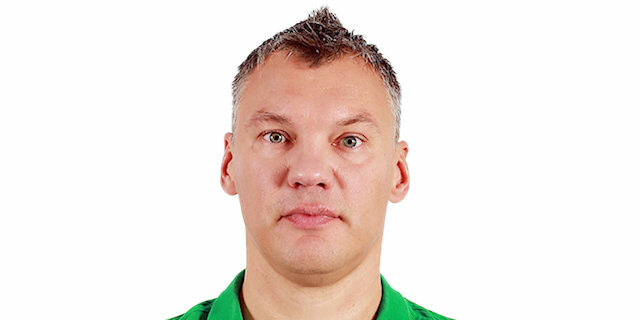 "I want to congratulate Zalgiris. It was a tough game. We had our chances, but our opponents took 18 offensive rebounds. They had 17 more rebounds than us. We lost by 2 points and I think poor rebounding cost us the game. We fought hard; we tried to play without our important player, Darius Miller. When you play on the road in the Top 16 and opponents grab 18 offensive rebounds, I think it is very hard to win a game."